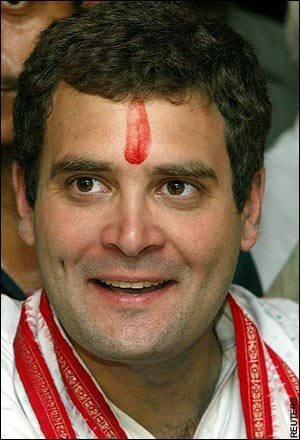 Hail Rahul Gandhi! !--future emperor of India--Its his birthday today !! 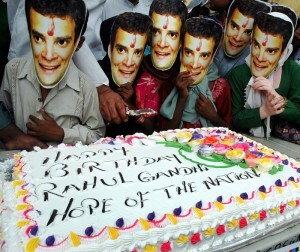 Big celebration day in the Congress camp as their young General Secretary Rahul Gandhi turns 40th Birthday today. The birthday of the young adorable politician is being celebrated throughout the country by the Congress Party workers by firing crackers and dancing on the streets. Sweets were also distributed among the party members throughout the country. The potential candidate for the post of Prime Minister was born on June 19, 1970 in New Delhi. He is one of the two children of the Former Prime Minister Rajiv Gandhi and Sonia Gandhi. He has a younger sister, Priyanka Gandhi. He is presently representing Amethi constituency. Well, on the auspecious occasion of birthday, many people would be expected somthing about the marriage of the bachelor. Last edited by echarcha; June 19th, 2010 at 09:11 AM. Re: Hail Rahul Gandhi! !--future emperor of India--Its his birthday today !! Shh........bade logon ke baare may aisaa nahi boltey !! 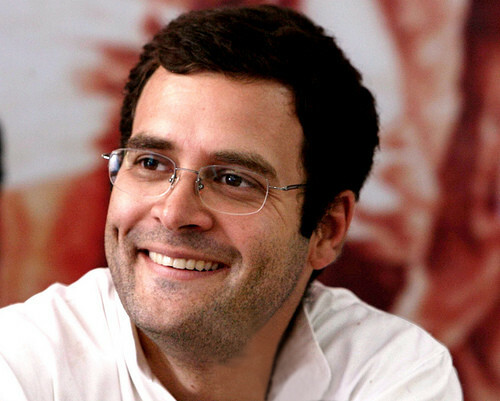 Happy B'day to you....Happy B'day to you.....Happy B'day to you Rahul Baba!! Rahul ji Gandhi ji ki jai... when are they killing Sonia so this sucker can come to power and sacrifice his life for the nation as per his family tradition. Well, on the auspecious occasion of birthday, many people would be expected somthing about the marriage of the bachelor. Thank God our girls find him attractive and marriage material and not someone from across the border like Sania did. Hope he follows his Dad's footsteps not fellow kaangressis. PS: this thread do not qualify for "Breaking News" norms and format. I am moving it. Request to all, please use common sense and gudidelines before starting a thread. We are all educated ppl here. Amtha bhau, socho.. India's future PM and India's destiny is this man Rahul ji Gandhi. He deserves a standing ovation from all of us, not only on his birthday but also for his every move, every fart! Seriously, without the Nehru clan and Congress party, our country would be in shambles. And this thread does not even disqualify tantuji's norms... 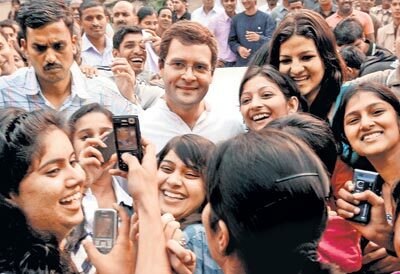 He does not like photos of ugly old men on the front page... Rahul ji is the handsomest man in Indian political class! Sorry Amtha bhau, I feel lik epaying tributes to this wonderful young scion! Next time format the headline or I will personally move the thread out. Today it was Rahul ji Gandhi and so I let it slip. Bofors tak public ko pata tha,ab Bhopal nikla aage aage dekho kya kya niklega. Aur yeh Sonia maata ek baar satte se utarne do fir iski kitni sari khulegi woh dekhte hai.. I wish this happens soon .